It turns out, pretty well. Captain Marvel is very good. Not quite as good perhaps, as the best Marvel films but a solid upper tier that maybe can make a weak claim to be top 5. It also helps fill in some of the lore behind the MCU, and sets up Endgame, the fourth Avengers movie and the finale of the first 3 phases of said MCU. Special mention must be made of the Marvel Studios production logo, which featured a tribute to former head honcho Stan Lee by exclusively featuring scenes from his many cameos instead of the usual snippets of different characters from the series. He also appears in one of his final cameos in the movie itself reading a script for the movie Mallrats. A sweet touch. Like with the other MCU movies, this film is one hell of a spectacle. The landscapes are numerous and diverse; one moment you’re in cosmic Kree space in a futuristic city, then you’re in a crappy border planet, and finally in 90s Earth, where Blockbusters are still ubiquitous along with Radio Shacks, and people still sport pagers. Those of you who grew up outside the US might not get some of the 90s might not get all the references. Some born in the 2000s might not get them at all. Of particular note are the scenes when Captain Marvel blasts up what appears to be a ad cutout for True Lies and builds an communicator out of an original monochrome GameBoy. Another nod comes in the form of a computer transferring info painfully slowly, and dropped dial-up connections. As a child of the 90s, fond memories indeed. The inescapable CGI is present in full force, and is suitably mindblowing. The de-aging tech used on Samuel L. Jackson has been refined to the point where it is virtually indistinguishable from say, his appearance in Pulp Fiction or Die Hard 3. It really is a pinnacle of the technology used. We’ve come a loooong way form Iron man and Antman. Sure, Clark Gregg doesn’t fare quite as well in comparison but it’s clear where the priorities lied. The illusion is only betrayed by the actual physical acting; no amount of CG can cover up the fact that Jackson is 70 years old and moves like a person with that many years on him. The rest of the film is hit and miss though- one particular scene near the end where a plane crashes looks especially awful. The score is… meh. They used a lot of songs from the 90s but not very many of them were truly iconic pop 90s tunes. Admittedly it would be too much to have the Backstreet Boys, or Britney, or the Spice Girls, and the selection is fairly good in its own right, it just didn’t do very much for me. The same can be said for the original score, which again is mostly background stuff except for the main Avengers theme at the end of the film. Of course, due praise must be given to Brie Larson, who brings a witty humor to the titular captain. Some of her scenes can be stiff and hammy, but she brings the fire where it counts. Pulling off the role of what Marvel maestro Kevin Feige describes as the “most powerful superhero we [Marvel] have ever introduced” required a, shall we say, superhuman performance and Larson fully lives up to that challenge. Samuel L. Jackson similarly steals the film with his charm and humor. The man is a living legend at this point, and he turns in a rock solid performance as a not quite head of S.H.I.E.L.D Nick Fury, although the role is a tad more goofy than I’d like. As for the main plot itself- suffice to say that the trailers are way more misleading to what the final story line was. MAJOR SPOILERS AFTER THIS PART. YOU HAVE BEEN WARNED. Captain Marvel opens up in media res, where Captain Marvel, then known as Vers, a soldier in the Kree (from GOTG) army, is having a mysterious dream. We see her go about her regular day, meet her superiors, then go on a mission to meet an agent on a border planet where the enemies of the Keee, shape-shifting aliens known as the Skrulls may have infiltrated. Things go wrong, Vers gets captured, she escapes and ends up on Earth where she meets Nick Fury, learns more about her parts, the events that led to her becoming a Kree soldier, and what she was doing before the war and the nature of the war itself. The most surprising twist is that the Skrulls aren’t the big bad enemies as they are shown traditionally. the trailers are cut to look that way, but if you’ve seen GOTG already you’d know that the Kree are no saints. Ronan himself shows up in a few scenes in the film to drive the point home, and his presence is the first inkling that something is not quite right about the situation. The reveal itself however, is handled quite well and the build up is such that the illusion isn’t quite spoiled before the big twist occurs. The expectation is that someone high up IS is Skrull, not that the Skrulls themselves aren’t the true enemy. Speaking of which, the Skrulls themselves aren’t quite as fleshed out as you’d like. Most of the focus is on Talos, one of their leaders ostensibly; he’s at least high ranking enough to have his own ship. Played brilliantly against type by Ben Mendelsohn, he is fantastically charismatic. The whole concept of the Skrulls don’t quite live up to their potential though; the fact that anyone can be a Skrull simply isn’t explored deeply enough in the film, which admittedly isn’t the type of film they were going for due to the nature of the story. Instead, it’s the Kree that are the big bad overlords seeking to exterminate the shape-shifters. One of them, Wendy Larson, however defects and escapes to Earth where she discovers a weapon (the Tesseract AKA Space Stone), using it instead to make a spaceship capable of fleeing the Kree. She succeeds, but in testing out the engine for the ship gets shot down with Carol DanVERS, a human test pilot, and dies. 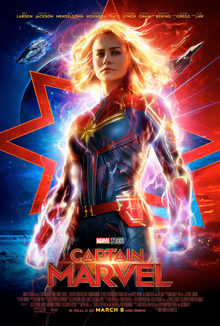 Carol blows up the engine core, absorbs its powers, and gets captured by the Kree and gets shipped off to their homeworld so she can be a weapon for them. Absorbing all this power is of course what makes Captain Marvel of of the the major powerhouses in the MCU. She can fly, shoot beams of energy that are described as photon blasts, can toss giant missiles around like toys and is durable enough to fly through a massive Kree warship like a hot knife through butter. She also might be able to fly faster than light, teased when she flies along the Skrull refugee ship at the end of the film. Having her on the team is a major catch for the Avengers, which of course have Endgame due to open in April and at this current time just dropped a 2nd trailer. Captain Marvel also alludes to events due to happen in the MCU; the aforementioned Tesseract in yet another MacGuffin appearance, the origin of the Avengers name as a tribute to Carol’s callsign, the repurposing of Fury’s pager into the communicator in Infinity War. Speaking of Fury we also learn a bit of his history, along with how he really got that eye patch. And of course, the credits sequences. If nothing else, they show Carol is going to be a major player in Endgame and going forward in the MCU. The second one (there’s 2) is a throwaway gag featuring an alien cat that appears throughout the film. Oh, and the scene where Carol changes the colors of her suit? Top tier stuff. Give me a scene in Endgame with the Neon light suit. PLEASE. All in all, Captain marvel is a great time. It’s not the best MCU film- hell it’s not even the best standalone/origin story film; Iron Man is still better and Black Panther/ First Avenger/ Homecoming give it a run for its money as well. And that’s just standalone movies- factor in ensemble crossovers like Ragnarok, Civil War, and the Avengers films and competition is stiff. It is solidly in the top third of the pantheon (IMO), and makes a case for bottom of top 5. It certainly sets up Endgame, and builds up hype for the final film of Phase 3. Bring it on, Thanos.